Police are searching for a vehicle and the driver involved in a hit-and-and run in Zion that killed a 19-year-old Wisconsin man about 12:50 a.m. Saturday October 21, 2017 on Green Bay Road south of 9th Street, Zion near the Stonebridge development. Randy Harrison, age 19 of Pleasant Prairie, Wisconsin, was killed and his friend was injured in the hit-and-run incident. 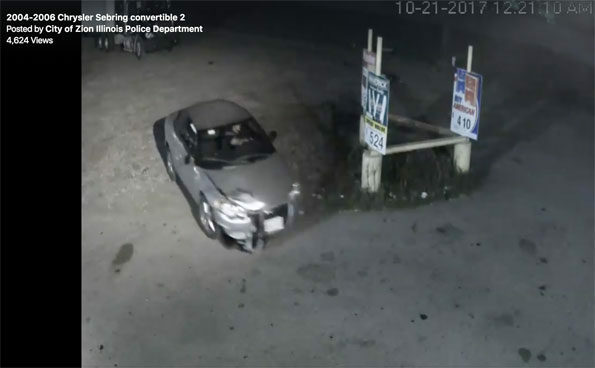 The vehicle suspected of being involved in the hit-and-run was captured on video and then discovered on surveillance video, after it was initially described at the scene as a 2004-2006 silver Chrysler Sebring convertible. 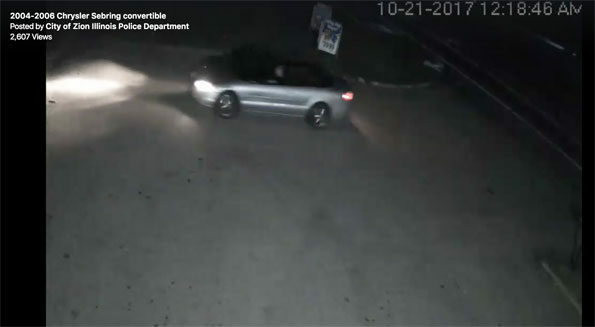 The vehicle and driver are wanted for investigation in connection with the fatal hit-and-run. The Chrysler Sebring convertible was captured on surveillance video about a half mile south of the hit-and-run scene at the Tobacco Outlet, at Route 173 and Green Bay Road, where the driver pulled into the parking lot after the incident, police said. Zion Police: Vehicle Wanted Hit and Run. The video shows the convertible Chrysler Sebring with its top down as it pulls into the lot. Then, minutes later, the car pulls out with the top up. The vehicle has significant damage on the front passenger side. Police said the driver is a white male with tattoos on his forearms. Before the crash, Harrison left his home in Pleasant Prairie with a friend to get some snacks. They were riding their bikes southbound on Green Bay Road. Both bicyclists were just south of 9th Street when, the southbound vehicle struck them both and kept going, according to police. Randy Harrison’s sustained non-life-threatening injuries. Police urge any citizen who recognizes the vehicle to call Zion police at 847-872-8000.